Express Pop Up Closet - Filosophie! Going to these Express events have been pretty exciting, experiencing all these new things. Going to the pop-up closet I had one question.. What IS a pop-up closet?! I kind of got an item from the fashion show event but I was on cold medicine and the high from being at the VIP party took over. A pop-up closet is basically a little, opened closet where they showcase new styles. Pretty damn cool to see. I gathered a bunch of my friends and decided to make a day out of it. 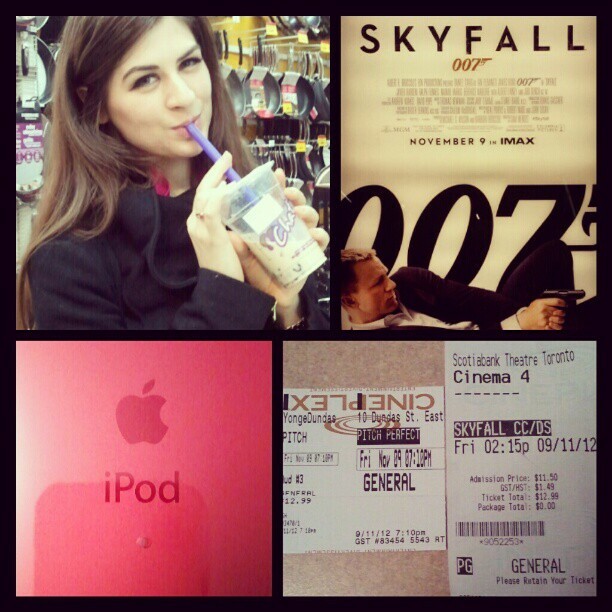 We saw Skyfall, grabbed some yummy bubble tea, then headed to the AMC on Friday. This was my outfit, you can't tell but I was wearing snake skin patterned leggings. Oh yeah! Shots were taken by my friends with my phone, excuse the blurry-ness! On the way we found the spot Express will have it's Grand Opening event! So I took a picture next to it. So obviously the first thing I did when I went home was to check out Express Canada and pick out what I was going to get. I made a little outfit that I FELL IN LOVE WITH. I need those pants and that shirt in my life. Just sayin'! I was really into the mannequin looks at the pop-up closet (first picture) of creme/light all over outfits. I wore a bunch of colour to the event because I remember bright colours at the pop-up closet at the fashion show event too! Thoughts on the outfit? What would items from Express Canada would you pair together?